How to choose the correct Regression Model? Lets take a simple example : Suppose your manager asked you to predict annual sales. There can be a hundred of factors (drivers) that affects sales. In this case, sales is your dependent variable. Factors affecting sales are independent variables. Regression analysis would help you to solve this problem. In simple words, regression analysis is used to model the relationship between a dependent variable and one or more independent variables. Which of the drivers have a significant impact on sales. What would be the annual sales next year. Suppose there is an observation in the dataset which is having a very high or very low value as compared to the other observations in the data, i.e. it does not belong to the population, such an observation is called an outlier. In simple words, it is extreme value. An outlier is a problem because many times it hampers the results we get. When the independent variables are highly correlated to each other then the variables are said to be multicollinear. Many types of regression techniques assumes multicollinearity should not be present in the dataset. It is because it causes problems in ranking variables based on its importance. Or it makes job difficult in selecting the most important independent variable (factor). When dependent variable's variability is not equal across values of an independent variable, it is called heteroscedasticity. Example - As one's income increases, the variability of food consumption will increase. A poorer person will spend a rather constant amount by always eating inexpensive food; a wealthier person may occasionally buy inexpensive food and at other times eat expensive meals. Those with higher incomes display a greater variability of food consumption. When we use unnecessary explanatory variables it might lead to overfitting. Overfitting means that our algorithm works well on the training set but is unable to perform better on the test sets. It is also known as problem of high variance. When our algorithm works so poorly that it is unable to fit even training set well then it is said to underfit the data. It is also known as problem of high bias. In the following diagram we can see that fitting a linear regression (straight line in fig 1) would underfit the data i.e. it will lead to large errors even in the training set. Using a polynomial fit in fig 2 is balanced i.e. such a fit can work on the training and test sets well, while in fig 3 the fit will lead to low errors in training set but it will not work well on the test set. Every regression technique has some assumptions attached to it which we need to meet before running analysis. These techniques differ in terms of type of dependent and independent variables and distribution. When you have only 1 independent variable and 1 dependent variable, it is called simple linear regression. When you have more than 1 independent variable and 1 dependent variable, it is called Multiple linear regression. Here 'y' is the dependent variable to be estimated, and X are the independent variables and ε is the error term. βi’s are the regression coefficients. There must be a linear relation between independent and dependent variables. There should not be any outliers present. Sample observations should be independent. Error terms should be normally distributed with mean 0 and constant variance. Absence of multicollinearity and auto-correlation. Estimating the parametersTo estimate the regression coefficients βi’s we use principle of least squares which is to minimize the sum of squares due to the error terms i.e. If no. of hours studied and no. of classes are 0 then the student will obtain 5 marks. Keeping no. of classes attended constant, if student studies for one hour more then he will score 2 more marks in the examination. Similarly keeping no. of hours studied constant, if student attends one more class then he will attain 0.5 marks more. We consider the swiss data set for carrying out linear regression in R. We use lm() function in the base package. We try to estimate Fertility with the help of other variables. Hence we can see that 70% of the variation in Fertility rate can be explained via linear regression. It is a technique to fit a nonlinear equation by taking polynomial functions of independent variable. 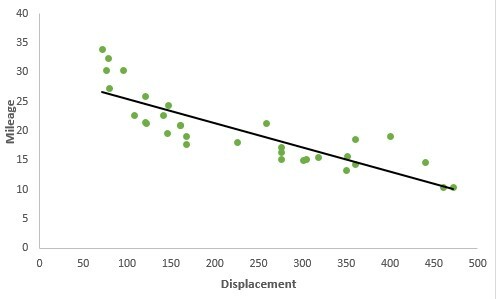 In the figure given below, you can see the red curve fits the data better than the green curve. Hence in the situations where the relation between the dependent and independent variable seems to be non-linear we can deploy Polynomial Regression Models. and can fit linear regression in the similar manner. In case of multiple variables say X1 and X2, we can create a third new feature (say X3) which is the product of X1 and X2 i.e. Disclaimer: It is to be kept in mind that creating unnecessary extra features or fitting polynomials of higher degree may lead to overfitting. 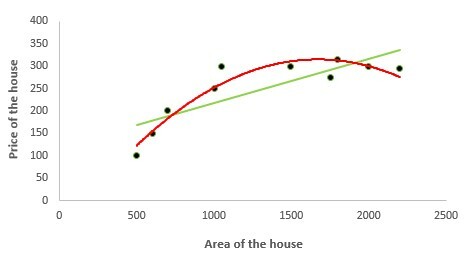 We are using poly.csv data for fitting polynomial regression where we try to estimate the Prices of the house given their area. We create a dataframe where the new variable are x and x square. Using ggplot2 package we try to create a plot to compare the curves by both linear and polynomial regression. In logistic regression, the dependent variable is binary in nature (having two categories). Independent variables can be continuous or binary. In multinomial logistic regression, you can have more than two categories in your dependent variable. Why don't we use linear regression in this case? The homoscedasticity assumption is violated. y follows binomial distribution and hence is not normal. HR Analytics: IT firms recruit large number of people, but one of the problems they encounter is after accepting the job offer many candidates do not join. So, this results in cost over-runs because they have to repeat the entire process again. Now when you get an application, can you actually predict whether that applicant is likely to join the organization (Binary Outcome - Join / Not Join). Elections: Suppose that we are interested in the factors that influence whether a political candidate wins an election. The outcome (response) variable is binary (0/1); win or lose. The predictor variables of interest are the amount of money spent on the campaign and the amount of time spent campaigning negatively. Thus we choose a cut-off of probability say 'p' and if P(Yi = 1) > p then we can say that Yi belongs to class 1 otherwise 0. If we take exponential of coefficients, then we’ll get odds ratio for ith explanatory variable. Suppose odds ratio is equal to two, then the odds of event is 2 times greater than the odds of non-event. Suppose dependent variable is customer attrition (whether customer will close relationship with the company) and independent variable is citizenship status (National / Expat). The odds of expat attrite is 3 times greater than the odds of a national attrite. In this case, we are trying to estimate whether a person will have cancer depending whether he smokes or not. We fit logistic regression with glm( ) function and we set family = "binomial"
Quantile regression is the extension of linear regression and we generally use it when outliers, high skeweness and heteroscedasticity exist in the data. In linear regression, we predict the mean of the dependent variable for given independent variables. Since mean does not describe the whole distribution, so modeling the mean is not a full description of a relationship between dependent and independent variables. So we can use quantile regression which predicts a quantile (or percentile) for given independent variables. Basic Idea of Quantile Regression: In quantile regression we try to estimate the quantile of the dependent variable given the values of X's. Note that the dependent variable should be continuous. where q is the qth quantile. It means that for one unit increase in x the estimated increase in 25th quantile of y by 700.823 units. Quite beneficial when heteroscedasticity is present in the data. Distribution of dependent variable can be described via various quantiles. It is more useful than linear regression when the data is skewed. Disclaimer on using quantile regression! It is to be kept in mind that the coefficients which we get in quantile regression for a particular quantile should differ significantly from those we obtain from linear regression. If it is not so then our usage of quantile regression isn't justifiable. This can be done by observing the confidence intervals of regression coefficients of the estimates obtained from both the regressions. We need to install quantreg package in order to carry out quantile regression. Using rq function we try to predict the estimate the 25th quantile of Fertility Rate in Swiss data. For this we set tau = 0.25. Setting tau = 0.5 we run the median regression. We can run quantile regression for multiple quantiles in a single plot. We can check whether our quantile regression results differ from the OLS results using plots. 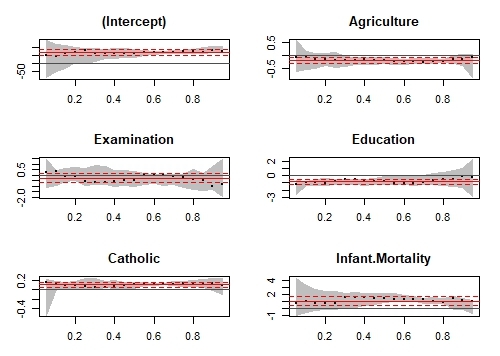 Various quantiles are depicted by X axis. 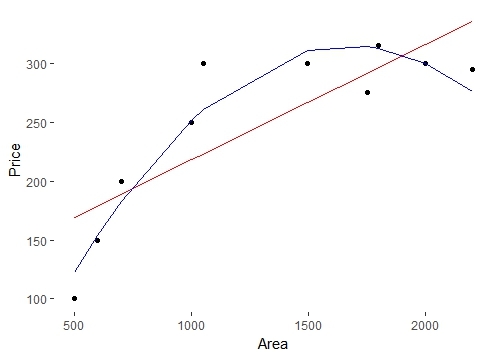 The red central line denotes the estimates of OLS coefficients and the dotted red lines are the confidence intervals around those OLS coefficients for various quantiles. The black dotted line are the quantile regression estimates and the gray area is the confidence interval for them for various quantiles. We can see that for all the variable both the regression estimated coincide for most of the quantiles. Hence our use of quantile regression is not justifiable for such quantiles. In other words we want that both the red and the gray lines should overlap as less as possible to justify our use of quantile regression. It's important to understand the concept of regularization before jumping to ridge regression. Regularization helps to solve over fitting problem which implies model performing well on training data but performing poorly on validation (test) data. Regularization solves this problem by adding a penalty term to the objective function and control the model complexity using that penalty term. In L1 regularization we try to minimize the objective function by adding a penalty term to the sum of the absolute values of coefficients. This is also known as least absolute deviations method. Lasso Regression makes use of L1 regularization. In L2 regularization we try to minimize the objective function by adding a penalty term to the sum of the squares of coefficients. Ridge Regression or shrinkage regression makes use of L2 regularization. In general, L2 performs better than L1 regularization. L2 is efficient in terms of computation. There is one area where L1 is considered as a preferred option over L2. L1 has in-built feature selection for sparse feature spaces. For example, you are predicting whether a person is having a brain tumor using more than 20,000 genetic markers (features). It is known that the vast majority of genes have little or no effect on the presence or severity of most diseases. Here λ is the regularization parameter which is a non negative number. Here we do not assume normality in the error terms. We do not regularize the intercept term. The constraint is just on the sum of squares of regression coefficients of X's. We can see that ridge regression makes use of L2 regularization. How can we choose the regularization parameter λ? If we choose lambda = 0 then we get back to the usual OLS estimates. If lambda is chosen to be very large then it will lead to underfitting. Thus it is highly important to determine a desirable value of lambda. To tackle this issue, we plot the parameter estimates against different values of lambda and select the minimum value of λ after which the parameters tend to stabilize. Considering the swiss data set, we create two different datasets, one containing dependent variable and other containing independent variables. We need to load glmnet library to carry out ridge regression. Using cv.glmnet( ) function we can do cross validation. By default alpha = 0 which means we are carrying out ridge regression. lambda is a sequence of various values of lambda which will be used for cross validation. set.seed(123) #Setting the seed to get similar results. We take the best lambda by using lambda.min and hence get the regression coefficients using predict function. 6 x 1 sparse Matrix of class "dgCMatrix"
λ is the regularization parameter and the intercept term is not regularized. We do not assume that the error terms are normally distributed. For the estimates we don't have any specific mathematical formula but we can obtain the estimates using some statistical software. Note that lasso regression also needs standardization. Lasso regression can perform in-built variable selection as well as parameter shrinkage. While using ridge regression one may end up getting all the variables but with Shrinked Paramaters. #Creating dependent and independent variables. Using cv.glmnet in glmnet package we do cross validation. For lasso regression we set alpha = 1. By default standardize = TRUE hence we do not need to standardize the variables seperately. We consider the best value of lambda by filtering out lamba.min from the model and hence get the coefficients using predict function. Which one is better - Ridge regression or Lasso regression? Both ridge regression and lasso regression are addressed to deal with multicollinearity. Ridge regression is computationally more efficient over lasso regression. Any of them can perform better. So the best approach is to select that regression model which fits the test set data well. Elastic Net regression is preferred over both ridge and lasso regression when one is dealing with highly correlated independent variables. It is a combination of both L1 and L2 regularization. Like ridge and lasso regression, it does not assume normality. Setting some different value of alpha between 0 and 1 we can carry out elastic net regression. Principal components analysis is a statistical method to extract new features when the original features are highly correlated. We create new features with the help of original features such that the new features are uncorrelated. The first PC is having the maximum variance. Similarly we can find the second PC U2 such that it is uncorrelated with U1 and has the second largest variance. In a similar manner for 'p' features we can have a maximum of 'p' PCs such that all the PCs are uncorrelated with each other and the first PC has the maximum variance, then 2nd PC has the maximum variance and so on. It is to be mentioned that PCR is not a feature selection technique instead it is a feature extraction technique. Each principle component we obtain is a function of all the features. Hence on using principal components one would be unable to explain which factor is affecting the dependent variable to what extent. We use the longley data set available in R which is used for high multicollinearity. We excplude the Year column. We use pls package in order to run PCR. 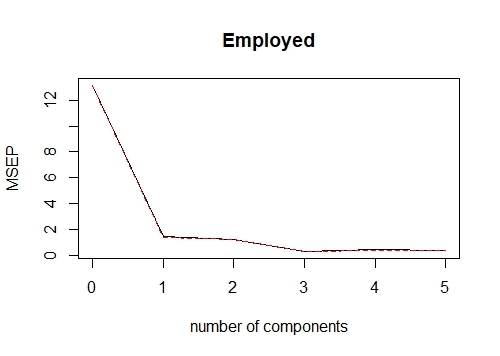 In PCR we are trying to estimate the number of Employed people; scale = T denotes that we are standardizing the variables; validation = "CV" denotes applicability of cross-validation. Here in the RMSEP the root mean square errors are being denoted. 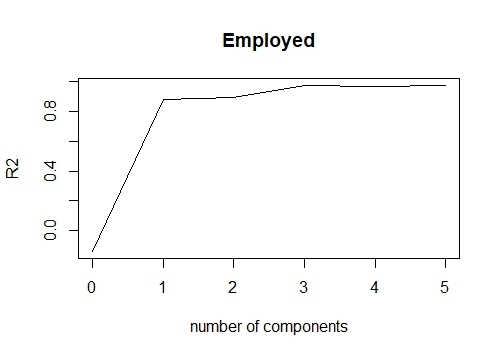 While in 'Training: %variance explained' the cumulative % of variance explained by principle components is being depicted. We can see that with 3 PCs more than 99% of variation can be attributed. We can also create a plot depicting the mean squares error for the number of various PCs. By writing val.type = "R2" we can plot the R square for various no. of PCs. It is an alternative technique of principal component regression when you have independent variables highly correlated. It is also useful when there are a large number of independent variables. Both techniques create new independent variables called components which are linear combinations of the original predictor variables but PCR creates components to explain the observed variability in the predictor variables, without considering the response variable at all. While PLS takes the dependent variable into account, and therefore often leads to models that are able to fit the dependent variable with fewer components. Support vector regression can solve both linear and non-linear models. SVM uses non-linear kernel functions (such as polynomial) to find the optimal solution for non-linear models. The main idea of SVR is to minimize error, individualizing the hyperplane which maximizes the margin. Ordinal Regression is used to predict ranked values. In simple words, this type of regression is suitable when dependent variable is ordinal in nature. Example of ordinal variables - Survey responses (1 to 6 scale), patient reaction to drug dose (none, mild, severe). Why we can't use linear regression when dealing with ordinal target variable? In linear regression, the dependent variable assumes that changes in the level of the dependent variable are equivalent throughout the range of the variable. For example, the difference in weight between a person who is 100 kg and a person who is 120 kg is 20kg, which has the same meaning as the difference in weight between a person who is 150 kg and a person who is 170 kg. These relationships do not necessarily hold for ordinal variables. Poisson regression is used when dependent variable has count data. The dependent variable has a Poisson distribution. In the code below, we are using dataset named warpbreaks which shows the number of breaks in Yarn during weaving. In this case, the model includes terms for wool type, wool tension and the interaction between the two. Like Poisson Regression, it also deals with count data. The question arises "how it is different from poisson regression". The answer is negative binomial regression does not assume distribution of count having variance equal to its mean. While poisson regression assumes the variance equal to its mean. When the variance of count data is greater than the mean count, it is a case of overdispersion. The opposite of the previous statement is a case of under-dispersion. It is an alternative to negative binomial regression. It can also be used for overdispersed count data. Both the algorithms give similar results, there are differences in estimating the effects of covariates. The variance of a quasi-Poisson model is a linear function of the mean while the variance of a negative binomial model is a quadratic function of the mean. Quasi-Poisson regression can handle both over-dispersion and under-dispersion. Time from customer opened the account until attrition. Time after cancer treatment until death. Time from first heart attack to the second. Logistic regression uses a binary dependent variable but ignores the timing of events. As well as estimating the time it takes to reach a certain event, survival analysis can also be used to compare time-to-event for multiple groups. 1. A continuous variable representing the time to event. 2. A binary variable representing the status whether event occurred or not. If dependent variable is continuous and model is suffering from collinearity or there are a lot of independent variables, you can try PCR, PLS, ridge, lasso and elastic net regressions. You can select the final model based on Adjusted r-square, RMSE, AIC and BIC. If you are working on count data, you should try poisson, quasi-poisson and negative binomial regression. To avoid overfitting, we can use cross-validation method to evaluate models used for prediction. We can also use ridge, lasso and elastic net regressions techniques to correct overfitting issue. Try support vector regression when you have non-linear model. 19 Responses to "15 Types of Regression you should know"
Should the part where you say "When you have more than 1 independent variable and 1 dependent variable, it is called simple linear regression" be multiple linear regression? It would be good to clarify because it comes right after "When you have only 1 independent variable and 1 dependent variable, it is called simple linear regression" and as a reader I would expect a contrast between the two blocks. Or if this is correct, a statement to validate that it is right after. Typo. Corrected! Thanks for highlighting. Cheers! Did you check the author name of Rblogger post? If you are talking about this post --> https://www.r-bloggers.com/15-types-of-regression-you-should-know/ it's the same one :) RBloggers is a compilation of many (personal) blogs, this being one of them. Reading "highly correlated independent variables" was initially confusing. The piece is very good but some few regressions are left out. Beta regression, probit regression, tobit regression and probably a few others. For probit and tobit, it is just good to extend the treatise on logistic regression and try to explain their differences and when it might be preferable to use probit or tobit rather than logit. I have read a document where someone was trying to diffentiate between logistic regression and logit. I could not get the difference really, is there any at all? The comment by Vsoch is really important to correct. What is the data set for Lung Cancer? This is great! I appreciate you explaining only what's necessary to inform a choice, but not defining all technical terms. I can look those up if I think a model's worth considering. excellent, very helpful, thank you. Was there a reason that multinomial logistical regression was left out? q\sum | \eps_i | + (1-q) \sum | \eps_i | = \sum | \eps_i |. Hi, very good article yet there is a details you may correct if you want. The polynomial regression you are describing it is still a linear regression because the dependent variable, y, depend linearly on the regression coefficients. The fact the y is not linear versus x does not matter. From the practical point of view it means that with GNU R you can still use the "lm" function like in lm(y ~ x^2) and it will work as expected. The matrix computation of the linear regression and the matrix X is also still valid. For what type of dependent data, support vector regression is applicable? Is it applicable for the case when dependent variable is discrete and bounded? Dependent variable should be continuous in nature. Can you please post some resources about how to deal with interactions in Regression using R? You have listed all kinds of regression models here. It would be great if you could cover Interactions and suggest how to interpret them. Maybe touching upon continuous, categorical, count and multilevel models. 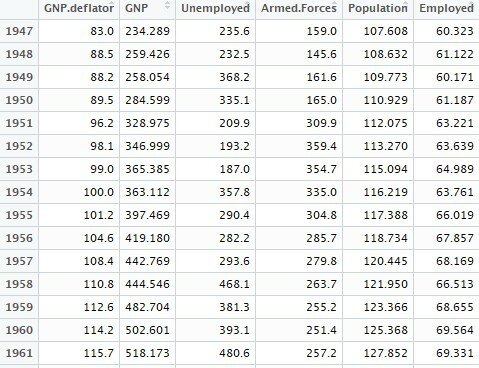 And giving some examples of real world data. Hello, I used a Likert scale in a questionnaire and run a model where the dependent variable is the value of the answer. Using an ordinal regression model, 2 or 3 categories are "underranked". So my model results weak. Do you have any sugestion? Actually I could sum the value of the answers value for each interviewee obtaining a result from 3 to 15. What kind of model could I use in this case?